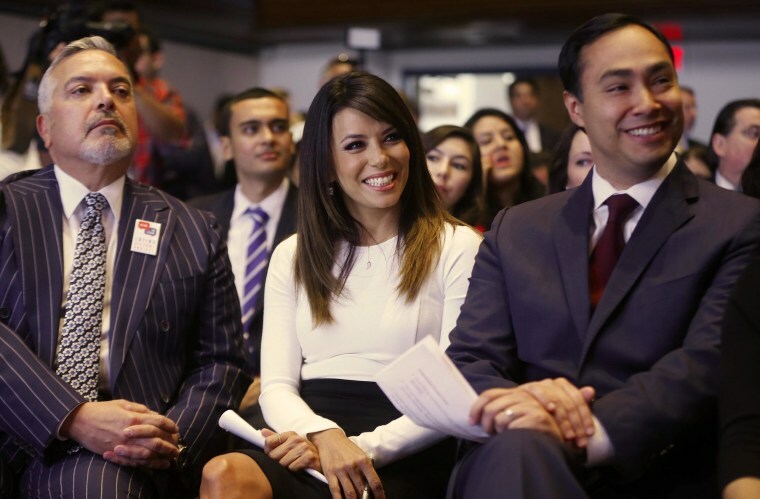 WASHINGTON, DC -- Actress and political activist Eva Longoria threw her support Monday behind a group of Latino candidates running in 2014 as she and other Latinos announced the formation of a new political action committee and national initiative to boost Hispanic political participation. "We can't as a community be so engaged in the presidential election and elect a president and yet not turn out for the midterm to elect the people who will work for the president,” said Longoria, who was joined by Texas philanthropist and political activist Henry Muñoz III as they announced the Latino Victory Project in the launch of the group on Cinco de Mayo. The Victory Project's aim, said Longoria, is to boost the number of Hispanic candidates in local, state and national elections. "It is incredibly important that we not wait for anyone; no person, no president, no party," Muñoz said. "If we are to be the future, then we have to take the future in our own hands," he added. The announcement was made with a backdrop of banners printed with faces of Latinos, as well as statistics of Hispanics and politics. There are only 28 members of the House of Representatives who are Latino (of those only 9 are Latinas) and there are only three Cuban-American senators. In the 2012 elections, 11 million Hispanics voted, but at the same time, over 12 million eligible Latinos did not vote. In 2014, the worry is that Latino political participation will be even lower than it usually is in the midterms. The group announced the formation of the Latino Victory PAC (political action committee), aimed at raising money and resources for Latino candidates. At the event the group announced its endorsement of seven federal and state level Hispanic candidates. One of them was Lucy Flores, a Democratic candidate for lieutenant governor in Nevada. Flores told NBC this high-profile support will make a difference. "In the past resources have not been there," said Flores. She said the PAC would give candidates like her visibility in the 2014 race. Leticia Van de Putte is a candidate for lieutenant governor on the ballot with Democratic gubernatorial candidate Wendy Davis in the high-stakes, high-profile Texas governor's race. Van de Putte told NBC that while there might be unresolved national issues when it comes to immigration, her hope was that voters would see the importance of voting in state and local elections where much of the state's laws and policies are determined. Other candidates which were singled out for support included Rhode Island Democratic gubernatorial candidate Angel Taveras, who is currently mayor of Providence and Amanda Renteria, a Democrat running for Congress in California's Central Valley. Longoria and Muñoz, along with Puerto Rican attorney Andrés López, were the trio behind the largest Latino fundraising group for the 2012 elections, The Futuro Fund, which bundled millions of dollars in Latino contributions for President Obama's re-election. Longoria was also one of the co-chairs of Obama's re-election campaign and Muñoz was named national finance chair for the Democratic National Committee. Lending visibility, financial resources and support to Latino political candidates is just one of the group's initiatives. Another one is building Latino empowerment through educational and professional attainment. Cristóbal Alex, the Latino Victory Project's president, said one of the group's goals was to reach 100,000 "firsts" - the first Latinos in their families to reach educational and professional milestones. As Eva Longoria said, the aim is to build "Latino currency."